Also see LM317 High Power Constant Current Source Circuit. A constant current source (CCS) in electronics is a device/circuit that produces a constant value of current regardless of source voltage or load resistance. 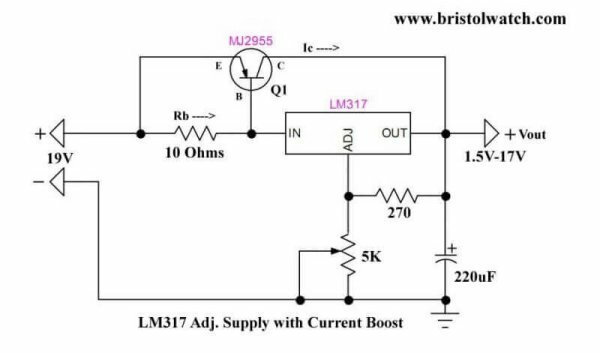 A constant current circuit can also be used as a current limiter. Earlier we discussed various constant current circuits using a PNP transistor, a LM741 OP-AMP and settled for a LM344 constant current source as the most stable. The downside is the LM334 can only source 10mA. The next series of circuits will use the LM317. While designed as a variable voltage regulator, it will double as a stable constant current source. With only three pins as shown above, one can produce a current of about 1-amp max. See LM317 Spec sheet. Fig. 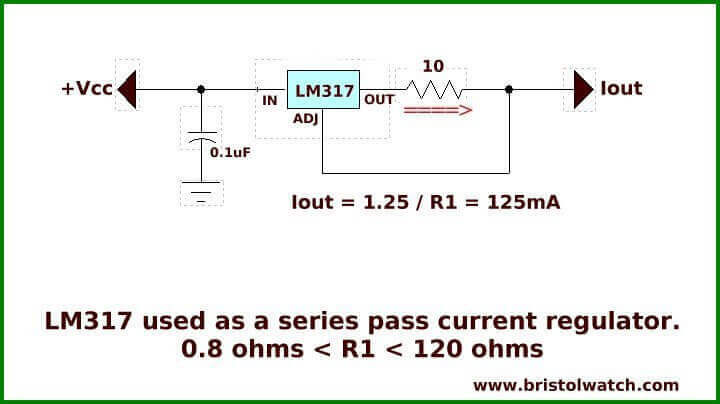 1 shows the LM317 used as a series pass constant current source with a single resistor. Resistor range is: 0.8 ohms < R1 < 120 ohms. The formula is Iout = 1.25V / R1. The 10 ohm resistor produces and current output of 125mA. For the TO-220 package I max = 1A while the TO-92 package is 500mA. LM317 driving three high-power white LEDs at 120mA. 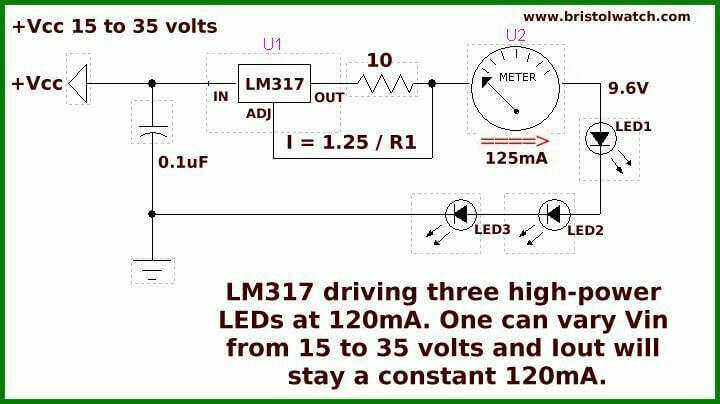 One can vary Vin from 15 to 35 volts and Iout will stay a constant 120mA. In Fig 3 the current has dropped below 120mA due to Vin of 12-volts to two close to the output voltage for the load. In general Vin > Vload + 5V. This makes LM317 useless as a constant current source below 5-volts. In Fig 4 we removed a LED for a voltage drop on the load at 6.4V restoring current regulation. 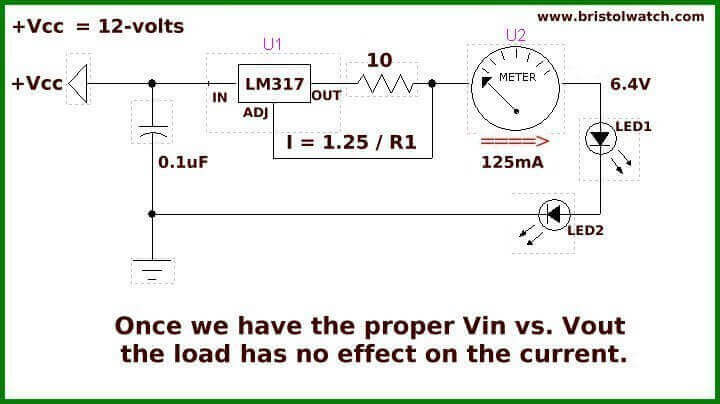 Once we have the proper Vin vs. Vout the load has no effect on the current. In Fig. 5 we have only a single LED yet the current remains 120mA. 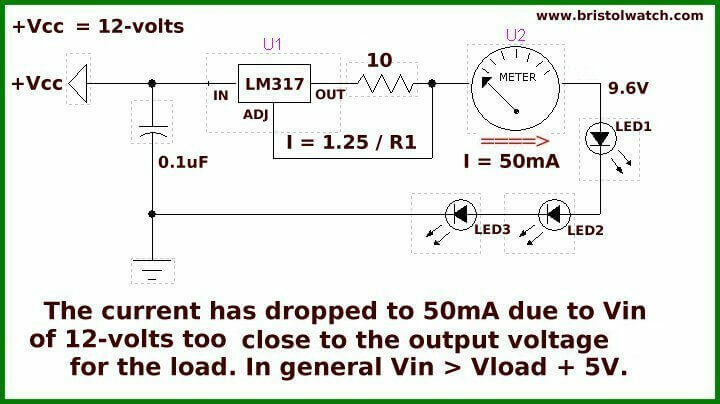 The load doesn't change the current from a constant current source in fact I could short out the output and maintain 120mA. 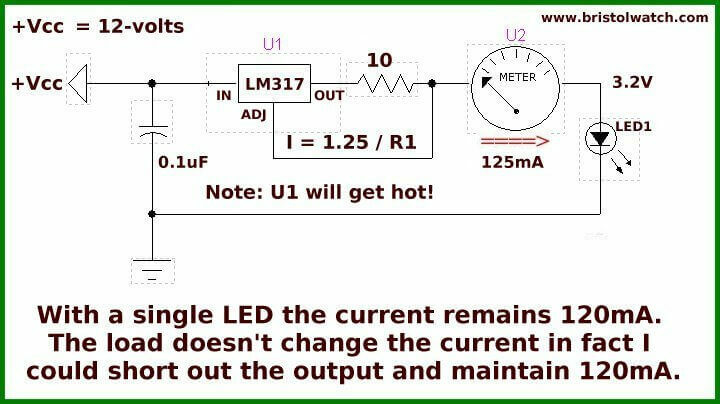 Note the LM317 will get hot - and voltage not dropped by the load will be dropped by the pass transistor, LM317 etc. Don't go wild with a large Vcc powering a small voltage load. Fig. 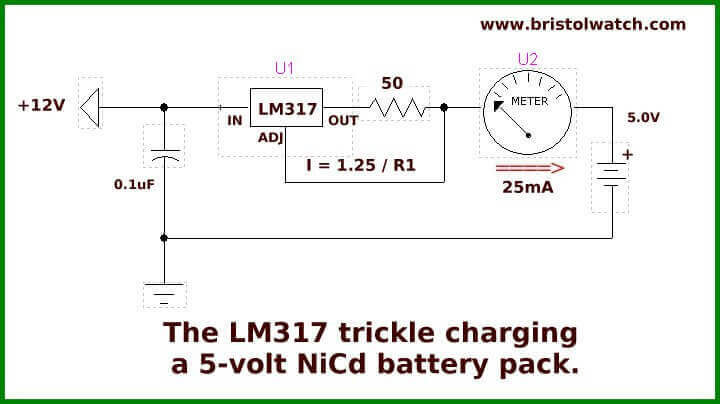 5 shows the LM317 trickle charging a 5-volt NiCd battery pack. This completes our introduction to the LM317 constant current source.